A New Zealand-Based Short-Term Lender. Short-term pay-day lenders have all sorts of negative connotations associated with them due to the lenders that target the people that need money out of desperation. 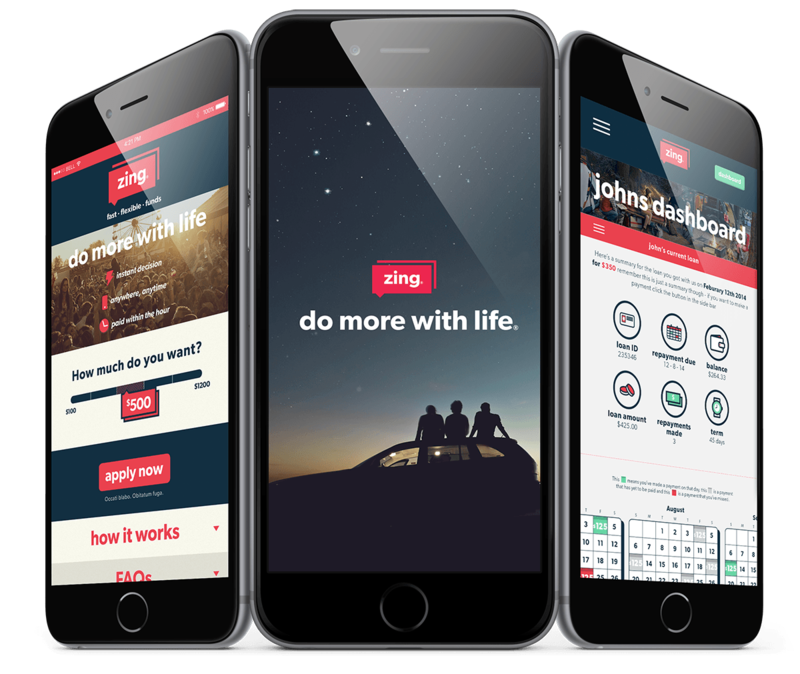 Unlike the rest, Zing is a lender that targets primarily young adults in their early to late twenties that don’t need money for this week’s rent but instead for this weekend. The guy that needs a bit of extra coin to get to Rhythm and Vines or last minute plane ticket to Aussie. My goal was to create a super non-daunting user-friendly experience when using the online app and also to position ourselves in such a way that wasn’t trying to hard to be a “fellow teenager” but still appealing to the right people. Click here for a more in depth look at the Web Design and User Interface aspect of Zing’s brand. Creating the brand mantra ‘do more with life’ coupled with exciting imagery of people ‘doing more with life’ paved the way for a touching sentiment urging people to escape the mundaneness of everyday life and to rattle that spontaneous note in their mind. Doing more with life via an extra bit of money ranged from people getting that extra $300 to go and visit mates in over-seas to using the app to buy that tent they needed for the camping trip with their mates. This universal notion was conducive to a lot of great looking imagery to use not only throughout our print media but in later multi-media campaigns too. 2. A cumbersome, jump-through-hoops experience to even get a small loan. Finding the solution to number one was obvious, detach ourselves as much as possible from those the lenders at that end of the spectrum by not using bait-advertising tactics ie. FREE, CASH NOW etc… Positioning ourselves in a way that appealed to a broader market than our actual demographic led-on that we weren’t too on-the-nose with our targeting (trying too hard to appeal to the “teens of today”). This was re-enforced with good-quality, commissioned photography, a sound message and a nod to our quick and painless approach to short-term lending applications. Number 2 exists for a reason, by nature getting a loan is typically full of arduous paper-work and hoop-jumping. We spent a lot of research and development making our application process super streamlined and super fast. A key focus was showing off our slick system with an intuitive user-interface making getting a loan next to effortless. We simplified our first process down to 3 steps: 1. How much the user wanted. 2. For how long 3. Clicking apply. We made it as easy as possible to get this information from the user by using effortless sliders on the homepage. Simple.